Genealogical research about Ephraim Knowlton Hanks, his family, and his ancestors. A collaboratively edited website, where anyone can add pages and content. I hope to migrate all the Hanksplace content to the wiki. I keep an online log of some of the research I'm doing (the stuff you see in the main section of the front page). Apsiring to be the definitive point online about Eph and his family. I put together a page about the final resting place of Jane, with several photos from a visit I made there. A collection of histories, books, documents and more digitized and freely available for all to enjoy. Still somewhat nascent. Raw image files I've uploaded but which I haven't had time yet to organize or put on the wiki. Some good stuff there. WorldConnect DB: A while back I uploaded a GEDCOM to Rootsweb's WorldConnect that provides much of the ancestry covered by this site. It's useful as a starting point, but (sadly) is mostly undocumented. The main goal of this site is to document those lines. Another set of images I've uploaded to the Raw Data section of the website are high-resolution scans of a scrapbook kept by Jane Maria Capener Giles. Several years ago while looking through Teton Jackman's "Big Red Book" on the descendants of Ephraim Hanks I noticed a handful of recipes that had been transcribed from a "scrapbook belonging to Jane Capener Hanks, now in the posession of Lela Morris of Shelley, Idaho"--or something to that effect. I was intrigued. Where was this scrapbook now? If it still existed it would be quite the treasure. I traced Lela's lines into Shelly, Idaho, and made a few calls to some of her relatives. One of the Hanks cousins I talked to there, Lisa Spells, said she remembered seeing the scrapbook when she was little but hadn't seen it for a while and didn't know where it was. I left it pretty much at that, but always kept it in the back of my mind to contine to look for the scrapbook. Fast forward to a couple of months ago. While visiting my parents prior to their leaving to serve a mission, I was talking with the wife of a cousin on my Mom's side, Irene Murdock. She said she was from Shelley, and little bells started going off in my head. I told her of my interest in the scrapbook, and we pulled out Teton's book to look over the lines of my Hanks cousins in Shelley. She knew a number of these people, and would be in the area in the following days. She said she would ask around. I got a call from Irene not too long after that. She had bumped into Lisa Spells at church while in Shelley that week, and Lisa mentioned they had found the scrapbook in the bottom of a box of things belonging to Lisa's mother. They were also having a reunion that weekend in Shelley, where the scrapbook would be on display. How exciting! My wife and I (bless her heart) quickly made plans to be in Shelley that weekend. We drove the long trek to Shelley (around 4 hours from Orem, UT with 4 kids) and found a wonderful branch of Eph and Jane's family (descendants of their son Ephraim Knowlton Hanks, Jr.) gathered together. Some of the folks I recognized from the reunion last summer. It was good to meet them and to rub shoulders with them. They had the scrapbook along with a lot of other interesting artifacts from EKH Jr. and their side of the family. I'll need to follow up to get photos of those items to put up on the website. The scrapbook is mostly filled with clippings of articles from old newspapers, many of which are about the men Jane had been married to earlier in life. The scrapbook also has a number of recipes (some of which ended up in Teton's book), as well as some of Jane's handwriting. We had come armed with a scanner and a digital camera in hopes of getting a digital copy of the scrapbook, but a cousin (by marriage), Sherry Hanks of Idaho Falls, had spent some quality time previously with Lisa and the scrapbook, and had it scanned at high resolution (see the link above). She was good enough to send me a copy of all the images on CD, and graciously gave her permission for me to put them online. As the book was falling apart she had all the pages put into archival-quality plastic sleeves so as to better preserve the old book for years to come. The long drive made for a very long day, but it was well worth it to connect with this branch of the family, and to form one more special connection to my great-grandmother Jane Maria Capener (Hanks, Taylor) Giles. Many thanks to Lisa Spells and her family for their efforts to locate and display the scrapbook, to Sherry Hanks for her time to digitize the contents and help preserve the book, and to Irene Murdock, for being in the right places at the right times! I hope you all enjoy the scrapbook! A while back I had digital photographs made of the entire contents of the Watch, Quarter, and Station Bill of the USS Columbus from the Navy Department Library. The book was essentially a duty roster kept on board the USS columbus during the voyage when Eph Hanks was aboard. I've had a CD with the images for a while now, and have planned to put them up on the wiki over time, but haven't quite got there yet. In an effort to make them available all the same, I've created a Raw Data section of this website, where I'm uploading all the images for whoever wants to look at them. Ephraim is mentioned a couple of times in the pages. He can be found on page 9, and on page 35. 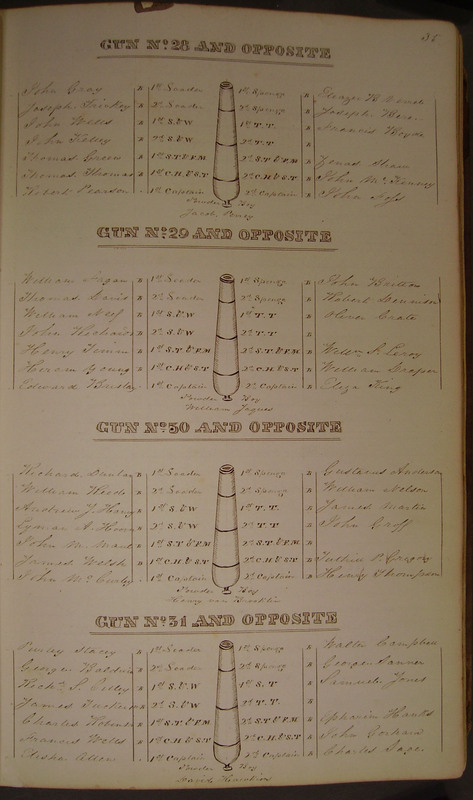 On page 9 are listed those sailors assigned to the fore top (the first platform on the forward mast of the ship). We also learn that Eph was assigned hammock number 209 and his "rate" or rank was 1.c.b, or "first-class-boy" (Eph was 16 when he came aboard). Also of interest on page 9, we see him listed next to a William Reed. From Scouting From the Mormons (hopefully soon to be reprinted, more details as that comes along) we learn that Bill Reed was Eph's buddy he worked with on the Erie Canal, and with whom he joined the Navy. Bill later went on to work at a hotel in Chicago, which Eph visited in later years. On page 35, we see Eph's assignment when the crew practiced "exercising the great guns." Lots of good stuff there and the pictures give us a further glimpse of what the ship looked like. I hope someday to be able to get all these images organized in the wiki, with full transcriptions of all the info. Someone out there is probably also looking for ancestors who served on board. The author of the letter is informing David of some of the events preceeding the death of David's step-brother, Walter Ernest Hanks. Walter was a son of Eph and Thisbe Quilley Read. 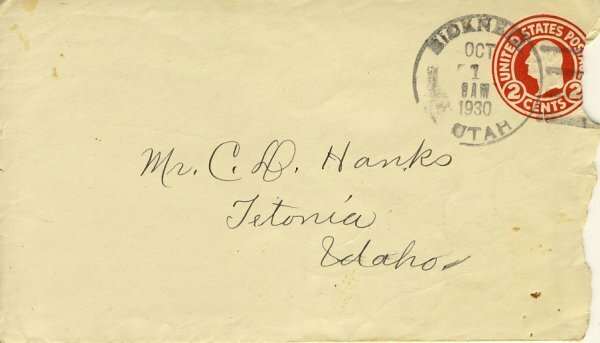 The letter is dated 30 Sept, 1930. Walter died 17 Sept, 1930. I have been a long time writing you about your dear Brother Walter's death which came on the 7 Sept at 10 A.M. but Mattie told us she would send you word. He was sick two months to the day. The immediate cause was heart and kidney trouble altho he had three strokes. He didn't suffer very much until the last week. He knew he was going and talked to us, and delivered some messages that loved ones from the other side gave him. His voice was so weak that we couldn't begin to understand near all he would tell us. One message from your Father was for us all to live better lives, pay out tithes and offerings to attend our Church duties, and temple work; and oh: if you could of seen him cry and beg us to do our duties and be of service to mankind it would of left a lasting impression. His clothes Casket and funeral was all that could be desired and I feel he was satisfied. I am sending back your book dear Brother, and hope you feel alright about us coppying the Hank's names out for Temple work and feel like you had made quite a contribution to the dead to let us take the book. Hope it reaches you in good shape. Many Many thanks for the use of it. Our Pedigree goes back to Benjamin Hanks and Abigal of Malmsburry England. We haven't got back any farther yet, but are having tracing done. By some of our Great Grandfathers marriage we go into a Gifford line, which makes ours and Pres. H.J. Grants Ancestors the same. We have some noble ancestors, and I feel, and Walter was so anxious to have us all get busy and gather up all the genealogy and get the work done up. So I hope we will all be interested I hope dear Brother you can take time to fill out the sheet for your Mothers family and for your own family as I am very anxious to get them. It has been raining for the last two days. Crops are about all gathered, and threshing has begun. We all send love to you all. Please let me hear if you get the book, and send the sheets. I had to search a bit to figure out who M.E. Hanks was that was writing the letter, but once I found her, it was obvious. 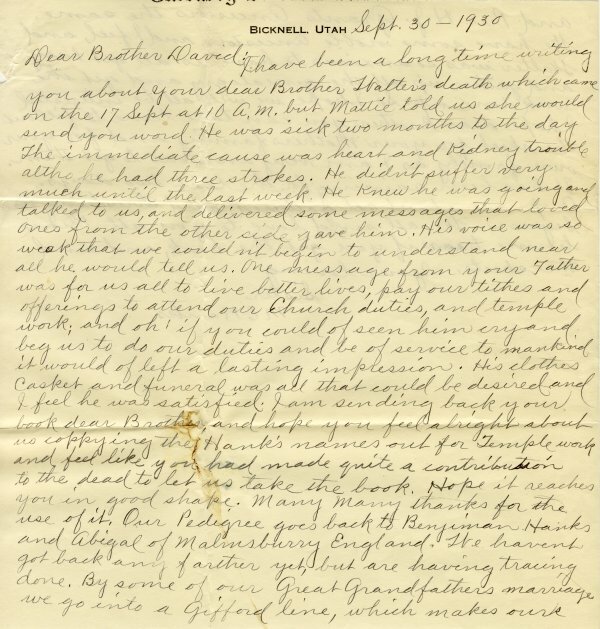 Walter's wife was Mary Ellen Stewart Hanks, born in Bicknell, Utah on 20 July, 1867. She died 26 Jul, 1944. At the time of Walter's death, David was less that 18 months away from his own death on 4 Jan, 1932. If you hail from Walter and Mary Ellen's descendants, I'd love to hear from you. I think the moral to this story is that you too may have 'buried treasure' hidden somewhere among your posessions. 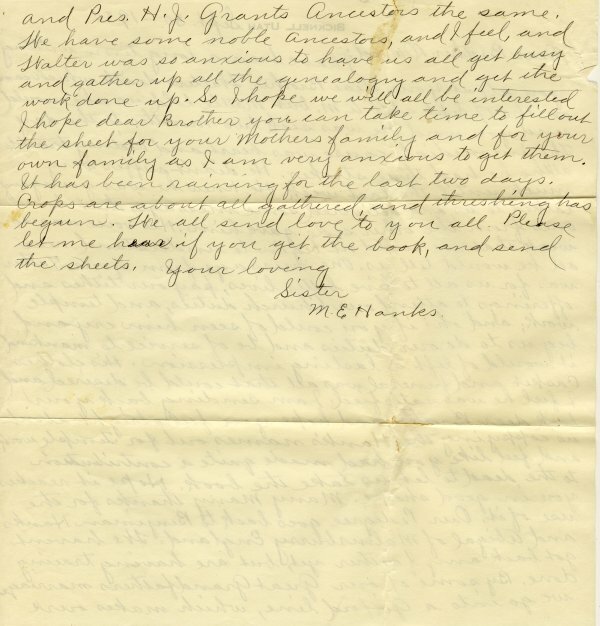 Do you have boxes of old family letters? Old journals? Scrap books? Old photos? If you have access to a scanner or a digital camera, make copies and drop me an email. I'd love to post it here. Bring them along to the Ephraim Hanks reunion this summer, and share them. These really are priceless treasures. Let's bring them out of the darkness and into the light. Wow. This site makes available digital versions (fully searchable) of past issues of a number of Utah newspapers, including the Deseret News from 1850-1898. If you have ancestors in early Utah, this is a gold mine. Found a nice picture of Eph Hanks Tower which is found in Capitol Reef National Park in Utah. This natural feature is close to the 'Floral Ranch' which Eph settled and in which he lived for the last years of his life. You may be familiar with the painting, "Ephraim K. Hanks - Obeying the Spirit", by Clark Kelly Price. I thought I'd put up a link to the spot on the artist's website where you can order prints of it. It's available signed or unsigned, in 5x7, 11x14, and 16x20. There are also some other excellent paintings available on the site. I didn't know her personally, but I imagine some visitors to this site probably did. The annual Mormon Handcart Pageant is going on this weekend, through Saturday night. It tells the stories of the Mormon Handcart Pioneers, and features Ephraim Hanks telling about his experiences with the Martin company. We went to last year's show and it was great. I'll be trying to find as many Hanks cousins as I can while we're there. The week before last I received in the mail from the National Archives (NARA) a microfilm containing about 40 days worth of deck logs from the USS Columbus. 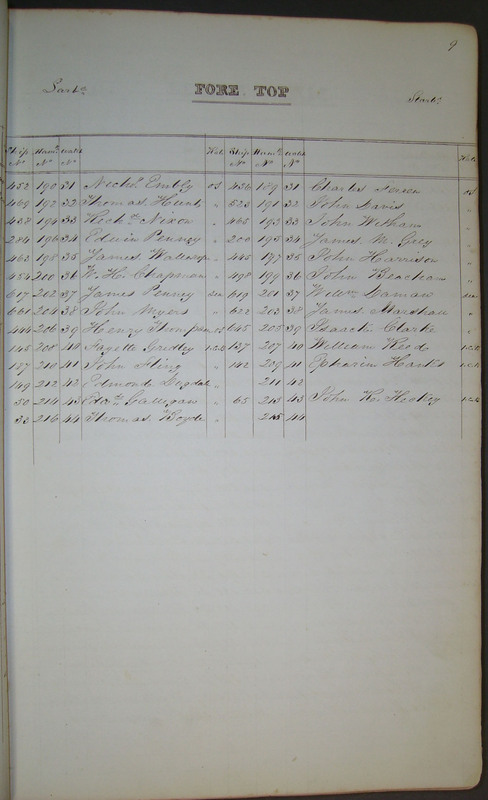 When Eph was aboard, the ship sailed from Boston on the 29th of August, 1842. The logs I have go from about 10 days prior to leaving the harbor, and about 30 days after that. Sunday evening I visited the local family history center and made copies of about 20 days worth of logs. I haven't seen Eph's name in the logs yet, but there's a good bet he might turn up. Probably our best chance for finding him would be to look even farther before the boat set sail. In the logs for the 10 days before the ship left, we see all the activity required to prepare such a large craft for a voyage. The logs report all supplies being brought on board from rope, to various knives, to compases, to sails and yards, to a pile of bricks. Each day's log is broken into a report from each "watch", the 24 hours being divided into 8 watches, 6 of which were 4 hours long, and 2 of which were 2 hours long (known as the "dog watches"). Each watch reports the direction of the wind, and the prevailing weather conditions, Any individuals coming aboard or leaving the vessel (even "the mortal remains of so-and-so") and their rate (rank) are reported. Also reported in the logs are names of individuals receiving punishment (by flogging) and the offense, including drunkeness, insolence, and even dropping a knife from the top. Once at sea the logs also contain hourly indications of the wind, direction of travel, and temperature of the air and water. My guess is that Eph came on board probably within a few months of the ship sailing, and assisted the other men in preparing to set sail. In his pension letter previously posted, he mentions he was transferred from the USS Ohio, which action would probably have been reported in the logs. So if I order another couple monthe previous to the date range I've currently got, we may find him there. There's a lot I could do with these logs. I think it would be fun to post each day's log on its anniversary day this year, along with commentary and explanation of the various terms used in each day's log entry. It would be fun to have graphics depicting the various configurations of the sails, masts and yards (sails were continually being adjusted to make best advantage of the wind). I think generating a list of all the men listed in the logs, and where they appear could prove to be a valuable genealogical resource for a lot of people. Perhaps I could apply for a grant to transcribe and post all the logs extant for the Columbus. Ah well, there's lots of work to do, but it looks to be a lot of fun! In a comment to my post about blog entry comments, 'clyman' asked if I could put information on the site about Hanks family reunions. What a great idea! If you know of a reunion for any branch of the Hanks family this year or in years to come, please either email me, or leave comments on this entry, and I'll add it to the Events section on the right. I believe there will be a reunion for descendants of David Capener and Emma Wright Hulet Hanks in the mid or late summer. I'll post more details as I get them. A year or so ago, a group of cousins got together down at Capitol Reef for a couple days together, and sounded like it was a lot of fun. I wasn't able to make it, but I've got a scout camp planned down there this summer. I've never been there myself (what a shame!) Perhaps we could set up a weekend where anyone interested could meet up down there for a fun weekend together. I've also thought it would be a grand event to sometime stage an Ephraim Hanks reunion. It would be a massive undertaking. At one estimate, all of Eph's descendants plus their families could be well over 10,000 people (perhaps that's over-estimating, but I'd bet it's at least 5,000). Between Eph and 3 of his wives, he fathered 27 children, many of whom had large families. A major part of the preparation would be trying to contact as many of his posterity as possible. I envision a day started off by a flag ceremony performed by the Mormon Battallion, handcarts, horses, 'pioneers', 'sailors', 'mountain men', a wireless hot-spot for research collaboration, lots of fun activities for the kids, good food (lots of dutch ovens), interesting presentations, and so forth. It would be a lot of work, but a memorable event. Perhaps it could be held in conjunction with the Mormon Handcart Pageant, held at the Juab, Utah County fairgounds (which would probably be large enough to accomodate such an event). It's probably too late to try and plan something like this for 2005, but perhaps 2006 or 2007? Do you know of a Hanks or other family reunion this year involving Eph Hanks descendants? What would you like to see at an Eph Hanks reunion? Leave your comments by clicking the link below!